Cheese is made from fresh milk by processing it, adding starter culture and coagulant and then processing it further – cutting, stirring, heating, draining, pressing and finally curing. Pale yellow colour (from deep yellow to nearly white), rich milk taste and smell without foreign odour. Convenience food production (especially pizza), processed cheese, retail sector, catering and hotel industry. 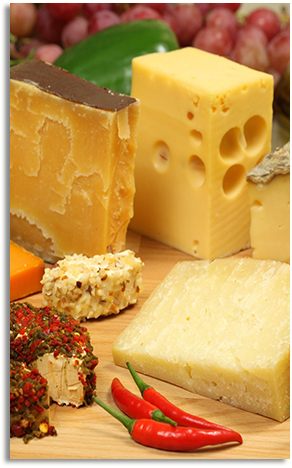 High fat, protein and minerals content, low lactose, long shelf life, ease of transportation, texture allows grating. Product must be stored in a cool, dry place, at temperatures between 2 and 4°C and relative humidity below 80%, product has 12 – 18 months shelf life in the original packaging. Individually coated blocks packed in cardboard boxes, various sizes.